P and I both thought the crochet Tiny Whale on the Planet June blog was really cute. 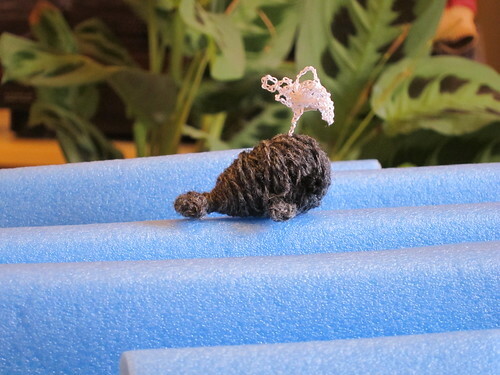 It reminded me of a plan for a yarn ball whale I had back when I was making Otis Redherring. I'm enjoying the book, but was missing the crafting, so something quick and easy seemed in order. The flippers and flukes are crochet (ch 3, sc, dc, then finish thread, or something close to that), then attached by taking the end threads through the ball and back again. The ball started as five long loops, basically the length of the body, the ends still show at the tail. It took a few tries to get the shape looking right. The front of the head was tricky to wrap the yarn over. I made the eyes and spout at home. The eyes are tiny bits, about 2-3 mm, cut from small drinking straws, wrapped in black embroidery thread. I checked my stash for black beads, but had none of even approximately the right size, and I just felt a really big French knot wouldn't be big enough for a whale's eyes. I am pleased with the removable spout. My first idea was to use some craft wire, but it just didn't stick into the ball of yarn. I didn't want to use a pin (yeah, I'm a responsible adult). Looking around my craft area, I saw a bit of plastic packaging, an old container for some alfalfa sprouts, I think. Why was it in my craft area, you may ask? I had meant to cut into a template or stencil, but hadn't got around to it. Anyway, I realized I could cut a spike shape with something at the top to support the crochet plume. Again, it took a few tries, but I do like the result. It's like a pointed Y shape, with the crochet tied on and wrapped down the trunk of the Y. The crochet is just loops chain stitch, 10 to 20 long, fastened back at the first stitch. I didn't have much of a plan and can't remember even roughly how many loops there are. I did do way too many and had to pull it out and restart. P likes the whale and has accepted it as part of his geekosphere. He's the one who came up with the clever title for this post.